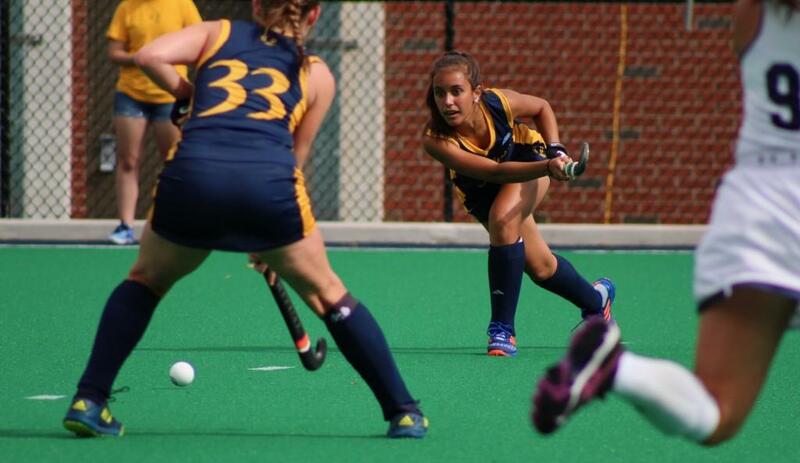 Mere hours after being selected as captains of the field hockey team, it was the newly-appointed leaders who shined the brightest in Quinnipiac’s 4-2 win over the rival Yale Bulldogs. Midfielder Dayna Barlow, forward Michelle Federico, and goaltender Livy Golini all played crucial roles for the Bobcats, who notched their first victory of the season, as well as their first victory at the brand new Quinnipiac Field Hockey Turf Complex. Quinnipiac dominated much of the first half, outshooting Yale 9-1 and outscoring them 2-0 in the first 35 minutes. After halftime, Yale made some adjustments, scrapping across nine shots and two late goals, but Quinnipiac stood tall when it mattered the most and added some insurance that helped result in the Bobcats emerging victorious. Despite some inconsistent play in the early going of the season, the Bobcats put together a complete effort from start to finish today. In particular, the play of the Bobcats’ newly-appointed captains really stood out. Golini shut the door late through an onslaught of Yale chances, Federico tallied an assist, and Barlow was all over the field, scoring on both her shot attempts. Coach Main was asked about Barlow’s impact on the team, both on and off the field. Barlow was more than appreciative of the praise. It was a total team effort for the Bobcats, who didn’t deny how special it was to pick up their first win against their crosstown rivals. The Bobcats (1-4) will look to build on their success with another game just 24 hours later, at Hofstra (2-3). It will be a good test for the resurgent Bobcats, who next return home on Sunday, September 17 against Monmouth (3-2).